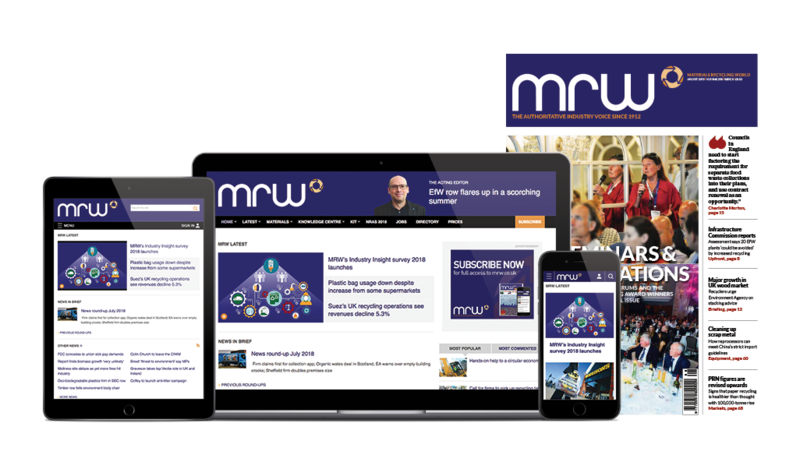 A leaked internal Environment Agency (EA) email, seen by MRW, has warned of a political crisis if waste needs to be stockpiled in the event of a no-deal Brexit. The email was outlined in a story on the front page of some editions of the Guardian newspaper. The story said the EA was preparing to deal with “putrefying stockpiles” of rubbish if exports of refuse-derived fuel (RDF) are affected. The email warned of stockpiled waste causing licence breaches and potential pollution inci­dents, which could “quickly escalate into a political [issue]” as waste companies would not be able to move the waste on. I am sending this directly to you all as it is a senior management request to every member of staff. …There are plans in place to create ‘technical cells’ to deal with specific issues and volunteers are being sought to resource those cells…At the moment there isn’t total clarity on specific tasks because the true impacts of a no-deal aren’t known. …If there is a no-deal scenario the current export of waste may cease for a period. This could result in stockpiled waste which causes licence breaches. Odours will obviously be an issue as the stockpiled waste putrefies and there may be runoff of leachates, causing secondary pollution. Whilst this may seem like a local Env management issue, it will quickly escalate into a political one because the operators will state that they have no means to move the waste, so what can they do. This will require a co-ordinated approach to how we handle these events. It will require a national position statement and a clear, single line of communication to all parties – the public and waste sector groups. The Guardian said waste export licences will “become invalid overnight” in the case of no-deal. But it failed to report on assurances issued to the RDF Export Group earlier this year that the majority of transfrontier waste ship­ment notifications will be allowed to continue by EU-competent authorities, as reported in the February issue of MRW. Defra said in a statement: “There is already a process in place to ensure the continuity of notified waste shipments in the case of a no-deal Brexit, which was set out by the European Commis­sion in November. We have received agreement to roll over 98% of existing consents for waste exports to the EU from the UK, agreeing 545 out of the 556 current approvals. MRW has heard that a number of waste and scrap metal businesses share concerns with the EA about the possi­bility of exceeding their permits after the UK leaves the EU on 29 March. Industry figures have also cast doubt on environment secretary Michael Gove’s claim that waste – mainly RDF – could be stockpiled near to ports if there is a no-deal Brexit. Gove made the assur­ances in a letter to Lord Teverson, chair of a House of Lords committee dealing with European environmental matters. Bywaters managing director John Glover warned that if vehicles were una­ble to pick up return loads of RDF, this would cause knock-on problems for the waste industry. The impact of a no-deal Brexit for waste shipments depends on the length of any delays, and our members will work hard to ensure as much as possible is recycled and recovered. Recyclable materials, the vast majority of which go to destinations other than the EU, will continue to be exported even under a no-deal scenario. For the three million tonnes of non-recyclable wastes currently exported to other EU member states, the industry and the Government have worked hard to ensure that the necessary regulations will be in place to maintain cross-border flows. There may be some short-term disruption at ports, in which case some relatively small quantities of non-recyclable waste may have to go to UK landfills rather than continental energy recovery facilities. This is due to a lack of spare energy-from-waste (EfW) capacity in the UK. In the longer term, the industry is investing to increase capacity. However, new EfW plants have significant lead-in times and so will not be in place if there were short-term disruption caused by a no-deal.